24 May 1487- The ten-year-old Lambert Simnel is crowned in Christ Church Cathedral in Dublin, Ireland, with the name of Edward VI in a bid to threaten King Henry VII's reign. 24 May 1533- Charles V. to his Ambassador in France. Since his last, touching the marriage of Henry VIII. and Anne Boleyn, has received letters from his ambassadors, stating that it has certainly taken place, and that the Queen has been forbidden to call herself Queen, and the Princess to write to her, &c. The people of England are scandalised at the King's barbarity. Is to show these things to Francis, and urge him as a Christian prince, and as related to Katharine by his wife, to denounce this marriage, or at least not to countenance it in any way or interfere with justice. He is also to deliver the Emperor's letters to the Queen, and urge her to use her best efforts in the matter. De Leyva writes that Montferrat is reduced all but Alba. Barcelona, 24 May 1533. 24 May 1536-John Thorneton to Lord [Erskine?]. Came hither (Antwerp) on the 14th instant. As I could not easily obtain posting to go myself to Rome, I have sent my errands by the post, who has promised to be in Rome and deliver my errands there this night, and I trust to have answer in 15 days, when I will return to Scotland with diligence. I hope your Lordship has obtained me the safe-conduct to pass through England which you promised me, but I have heard nothing thereof. Your Lordship will do the King our master great and singular pleasure, and have me indebted to you by sending it as soon as possible to Mons. Camillo Tadiattote's (?) bank here in Antwerp, where I am lodging. The merchants of London write that there will be no difficulty in sending it here if it be sped. I dare not return without it through England, as Mr. Cromwell's writing serves only for Calais and Dover, "and tha ar ellis out of handes and deliverit quhen I come over, and sua quhen I return againe, but [a salve] conductte I am war not of before and inclusit in ane horse net, quhilk God [keep] me fra in Ingland, and your L. ma put remeidy and ye pleise." Will gladly pay all the expenses. I hope to be ready to depart in WhitSunday week. There are three or four Scotch ships in Zealand ready to depart, "bot tha ar mor to aventur in, and grant apperans of breking of wey . . . . . . betwix France and the Imperator." Both Italy and Almain are furnishing the Emperor with men-of-war and necessaries. Sixty thousand men are passed to the Emperor's army, which will number 100,000 men. He has joined it himself. The 13th instant he was beside Placentia, 40 miles from Milan. I have sent to Scotland by sea copies of a writing I got from Rome, and of the Emperor's oration made before the Pope. The count Palatine has come with 13,000 men. Some say he passes to recover Denmark. The duke of Gueldres with 6,000 men is besieging Grinning, in Holland, and 3,000 men of this country have gone to defend it. All that he does is by the solicitation of France. They reck little of his intelligence with the Turk, who seeks to invade Hungary this year. A Scotchman, who lately came from Reusbrige, says that many of the Lutherans are turned again to the right faith because of the poverty and mischief that came amongst them since they erred. At Nuremberg, which was the worst, mass, matins, and all divine service are sung as before. There is an ambassador from England at Frankfort, who was with the duke of Saxony. I trust he is a bishop returning to England. They will not let him pass without the Emperor's command. At Frankfort a friar who had married a nun and had fair bairns with her, after coming from the preaching ran her through with a sword, and hanged himself in his own house; and, "on the morn," Barbour, who was a chief Lutheran, cut his own throat with a razor. In this country they are very good Christian people and devout. Many who were noted Lutherans before consider the sect to be dead, because they see their deeds and intentions to be evil. Commend me to Master Adam Mur (? ), Sir Jo. Ker, and all friends. Hantverpe, in Vigilia Ascensionis, 1536. 24 May 1543-Nicolaus Copernicus publishes proof of a sun-centered solar system. He dies just after publication. 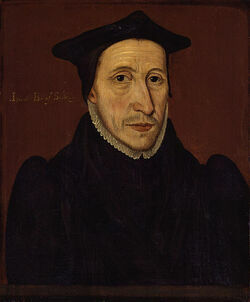 24 May 1546 – Letters were sent from Privy Council to Anne Askew and her estranged husband Thomas Kyme, ordering them to appear in front of the council within fourteen days. 24 May 1562 – Holinshed's Chronicle reported that on this day, a "monstrous birth" occured at Chichester in Sussex..
24 May 1576 - Birth of Elizabeth Chamberlain,Lady Berkeley,she was an English courtier and arts patroness, the only child of George Carey, 2nd Baron Hunsdon, and Elizabeth Spencer. 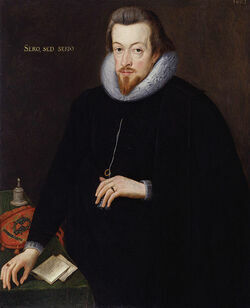 24 May 1612 - Death of Robert Cecil, 1st Earl of Salisbury,he was and the son of William Cecil, 1st Baron Burghley and Mildred Cooke. His half-brother was Thomas Cecil, 1st Earl of Exeter and philosopher Francis Bacon was his first cousin.